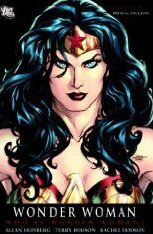 Wonder Woman is not an easy character to love. Interesting? Yes, but lovable? No. Writer Allen Heinberg and artists Terry and Rachel Dodson seek to rectify that situation and they succeed in some small way in Who is Wonder Woman?. This thin collection isn't a masterpiece but I did enjoy the way that the creators worked with the Amazon Princess, especially a late plot twist that changes the character for the future in an interesting way. I think I probably enjoyed this collection because of the appearances of other DC Universe characters -- Wonder Woman by herself just doesn't do it for me and, honestly, who doesn't love Donna Troy more than her sister? The artwork is decent, getting a bit weaker as the series goes on but that's typical. There are panels that are exactly the kind of cheap, modern art that I hate in comics and other sections that have a nice simultaneously light and heroic tone. I grew up on Marvel and barely touched DC Comics so it's weird to me that so many of the best titles that I seem to pick up lately are Batman related titles. Maybe it's simply a case of the most popular character drawing the best talent? In Batman: Private Casebook, writer Paul Dini and artist Dustin Nguyen deliver a nice, neat little set of unrelated stories that are easy to understand for those of us not keeping up with the monthly continuity of the DC Universe. 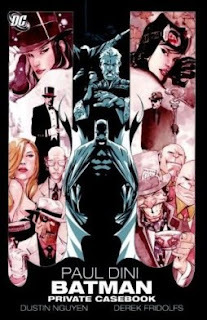 This collection reminded me of a print version of the best episodes of Batman: The Animated Series: not too serious, not too dark, but faithful to the source material. Dustin Nguyen was born to illustrate Batman in motion; Batman's cape is practically a separate character in this book. Not every issue succeeds but the portions with Ra's Al Ghul and a reformed Riddler seemed particularly good to me. The success of Batman is that he can survive so many interpretations and yet each one feels true to the character. Well, maybe not the recent Frank Miller one but that's just this fan's opinion.